Buy tickets now to see SKYSCRAPER 7/12-7/15 and you’re entered for a chance to win a Skype call with Dwayne Johnson, a tactical vest and a wristwatch! Sweepstakes Entry Period. The “Sweepstakes Entry Period” begins at 12:00:01 P.M. (CT) on July 3, 2018 and ends at 11:59:59 P.M. (CT) on July 19, 2018. Eligibility. 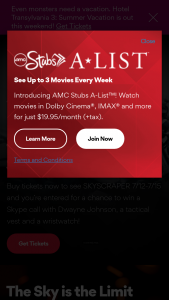 The SKYSCRAPER AMC SWEEPSTAKES (“Sweepstakes”) promotes the motion picture “Skyscraper” (the “Picture”). Sweepstakes is open only to legal U.S. residents residing in one of the 48 contiguous continental United States, excluding Rhode Island or the District of Columbia, who are at least: (a) 18 years of age or (b) the age of majority in their state of residence, if higher than 18, at the time of entry. Void in Alaska, Hawaii, Rhode Island, Puerto Rico, the U.S. Virgin Islands, other U.S. territories and possessions, U.S. military installations in foreign countries and where prohibited or restricted by law. Employees, officers, directors, members, managers, agents and representatives and their immediate families or members of their household (i.e., spouse, partner, parents, children, siblings, legal guardians, in-laws, grandparents and grandchildren, regardless of where they live) of American Multi-Cinema, Inc. (“Sponsor”), Universal Pictures (“Studio”), or each of their respective partners, affiliates, subsidiaries, parent companies, divisions and advertising, promotion, public relations agencies (collectively, “Promotion Entities”), are not eligible to enter or win. Studio is not responsible for the collection, submission or processing of entries, the administration of the Sweepstakes, the selection of winners or the fulfillment of prizes. Entrants are supplying their information to Sponsor and not to Studio. SKYSCRAPER Ticket Purchase with AMC Stubs® Card: Use your AMC Stubs Card when purchasing a ticket to SKYSCRAPER (“Film”) at any AMC theatre showing the Film, at amctheatres.com or at a designated ticketing partner’s website. For each ticket purchase transaction (subject to the limitation stated above) on a separate day during the Sweepstakes Entry Period. The AMC Stubs Member (as per Sponsor’s records) will receive one (1) entry. If the AMC Stubs Member purchases Film ticket(s) for guest(s), only the AMC Stubs Member, but not the guest(s) will receive entries. No entry will be received if the AMC Stubs Card is not presented by the AMC Stubs Member when purchasing the Film ticket at the box office or swiped by the AMC Stubs Member at an Automated Box Office (as applicable). For online purchases, no entry will be received if the complete AMC Stubs Card number is not inputted or recorded by the AMC Stubs Member in the designated area of www.amctheatres.com or a designated ticketing partner’s transaction website. No entry will be received if the ticket purchase transaction is later voided for any reason (e.g., non-payment) or use of AMC Stubs Card is determined by the Sponsor in its sole discretion not to be in full compliance with the Terms and Conditions of the AMC Stubs Program. Only complete and valid entries will be eligible. By entering the Sweepstakes, each entrant warrants that he or she has read and agrees to abide and be bound by these Official Rules and that he or she is not prohibited from participating in the Sweepstakes. Eligible entrants agree that Sponsor shall retain full authority, in its sole discretion, to interpret and administer these Official Rules, and entrants agree to be bound by all decisions and interpretations made in good faith by the Sponsor, or its designee. All entries become property of Sponsor and will not be acknowledged or returned. Entries that are late, incomplete, garbled/jumbled, illegible, misdirected, lost, damaged, delayed, stolen or otherwise not in compliance with these Official Rules are void. Entries made by any other individual or any entity, and/or originating at any other website or e-mail address, including, without limitation, commercial sweepstakes subscription notification and/or entering service sites, will be declared invalid and disqualified for this Sweepstakes. Promotion Entities are not responsible for technical failures of any kind, including, but not limited to, electronic malfunctioning of any telephone network, computer hardware or software; any failed, incomplete, garbled or delayed computer transmissions or any combination thereof; or for any error, human, technical or otherwise. Sponsor reserves the right, in its sole discretion, to disqualify any fraudulent entries or any individual it finds tampering with the operation or entry process of the Sweepstakes or acting in violation of these Official Rules. If, for any reason, an entry is determined by Sponsor to have been erroneously deleted, lost or otherwise destroyed or corrupted, entrant’s sole remedy is another entry in the Sweepstakes, if feasible; if not feasible for any reason, Sponsor shall not have any liability to entrant in conjunction with same. Winner Selection. On or about 7/30, Sponsor will randomly select one (1) entry, from all eligible entries received throughout the Sweepstakes Entry Period, to receive [Grand prize winner to receive a video chat conversation with Dwayne Johnson (“Talent”) timing TBD and subject to Talent availability]. Decisions of the Sponsor will be final and binding on all matters relating to this Sweepstakes. If a potential winner does not respond within five (5) business days of the first notification attempt, is found to be ineligible, does not comply with these Official Rules or declines to accept any prize, the potential winner may be disqualified in Sponsor’s sole discretion, and in such case Sponsor may (at its sole discretion)n select an alternate winner based on a random drawing. Grand prize winner to receive a video chat conversation with Talent with timing of such conversation at the sole discretion of Sponsor or its designee, but tentatively to take after release of the Picture (the “Prize”). Conversation portion of the Prize to take place no later than 12/31/18 and is subject to availability of Talent. In the event Talent is unavailable, Sponsor or Studio retain the right to award a prize of equal value. Approximate Retail Value: $320, the conversation has no monetary value. In order to accept the Prize, winner will be required to have some form of telecommunications application software product that provides video chat and voice calls between computers, tablets, mobile devices, gaming consoles, and smartwatches via the Internet and appropriate hardware. In the event that winner does not have video chat conversation capability, a standard audio-only telephone call conversation will be provided and no additional prize element substituted. Prize is not transferable. No substitution or cash redemption of the Prize, or any portion thereof, is allowed, except at the sole discretion of the Sponsor. Sponsor reserves the right to substitute the Prize with another prize of equal or greater value. Sponsor is not responsible for any inability of the winner to accept or use the Prize (or portion thereof) for any reason. No more than the stated Prize will be awarded. Winner is solely responsible for all unspecified costs and expenses associated with Prize acceptance and use. Prize is awarded “as is” with no warranty, representation or guarantee of any kind by Sponsor. Transfer of Prize is not permitted without the permission of Sponsor which may be granted or withheld in its sole discretion and without liability of any kind. A Prize value as stated represents Sponsor’s good faith determination of approximate retail value of prizing. Odds of Winning. Odds of winning the Prize depend upon the total number of eligible entries received during the Sweepstakes Entry Period. Claiming the Prize. The potential winner will be notified by e-mail (if provided) and/or mail or phone. In the event that Sponsor cannot contact a potential winner of the Prize despite reasonable (in its sole discretion) attempts, Sponsor may, in its sole discretion, randomly select a new, alternate potential winner from the remaining eligible entries received. Return of the Prize or prize notification as undeliverable (including, if applicable, due to failure of an AMC Stubs Member to include his/her current email address or mailing address as part of his/her Member profile information) will result in disqualification and an alternate potential winner may be selected in Sponsor’s sole discretion. The potential winner will be required to complete, execute and return to the address requested an Affidavit and Liability/Publicity Release within fourteen (14) days of receipt of the Prize Claim Documents. If such documents are not returned to Sponsor prior to such deadline, the Prize may be forfeited in Sponsor’s sole discretion, such potential winner shall be disqualified, and an alternate winner may (at sponsor’s sole discretion) be selected by Sponsor in a new random drawing from the remaining eligible entries. Except where prohibited by law, the Prize winner also grants Sponsor and its designees the right to use the winner’s full name, hometown, images and likenesses for advertising, publicity and promotion purposes, including print, broadcast and on-line announcements, without further compensation than the said prize and at no expense to the winner, and Sponsor shall not be obligated to make any such use. Taxes. The winner is responsible for all applicable local, state and federal taxes. Sponsor will issue winners of prizes valued at $600 or over an IRS 1099 Tax Form, and winner agrees to fully cooperate in complying with applicable governmental reporting requirements. If requested by Sponsor, the potential winner will be required to complete, sign and return to Sponsor an IRS Form W-9 prior to receiving the Prize. Failure to complete, sign and return a W-9 will result in the winner being disqualified, and in such case Sponsor may, in its sole discretion, select an alternate winner in a random drawing from remaining eligible entries. General. Each entrant agrees to, accepts and shall abide by these Official Rules and agrees that any disputes shall be resolved by Sponsor, in its sole discretion. Sponsor reserves the right to cancel/terminate, modify, amend or suspend the Sweepstakes if in Sponsor’s sole determination it believes that the integrity of the Sweepstakes has been, or could be, compromised or that the Sweepstakes is not capable of running as planned or fairly, including without limitation due to tampering, unauthorized intervention, fraud, or force majeure or any other causes beyond Sponsor’s control. Sweepstakes void where prohibited or restricted. If any provision of this Sweepstakes shall be deemed to violate any federal, state or municipal law, it shall be amended to conform to such law and all other provisions shall remain in full force and effect. Sponsor is not responsible for any typographical or other errors in the printing of these Official Rules, administration of this Sweepstakes or in the announcement of any winner(s) or Prize(s). In the event this Sweepstakes is cancelled for any reason, Sponsor reserves the right to conduct a random drawing to award the prizes from among all eligible, non-suspect, entries received prior to the time of the action or event warranting such cancellation. DISPUTES RESOLVED VIA ARBITRATION. To the fullest extent permitted by law, by participating in the Sweepstakes, you understand and agree that any claim or dispute regarding the Sweepstakes or these Official Rules will be resolved individually (NOT AS PART OF A CLASS ACTION/PROCEEDING) by means of binding arbitration (NOT IN A COURT OF LAW; THE RIGHT TO A JURY TRIAL IS BEING WAIVED). As fully set forth in the “Arbitration” provision of the Terms and Conditions of Use of the AMC Theatres website (accessible at amctheatres.com/terms-and-conditions), such arbitration will be conducted by a one-member panel of the American Arbitration Association; will be conducted under the Federal Arbitration Act; and will be governed by Missouri law, regardless of choice of law principles. Release. By participating, each entrant agrees to hold harmless the Promotion Entities, their respective employees, officers, directors, shareholders, representatives, agents, successors and assigns, from any liability whatsoever, and waive and release such parties from any and all causes of action, for any claims, costs, injuries, losses, or damages of any kind (including, without limitation, claims, costs, injuries, losses and damages related to personal injuries, death, damage to or destruction of property, rights of publicity or privacy, defamation or portrayal in a false light, whether intentional or unintentional) arising out of or in connection with the event or acceptance, possession, or use/misuse of any prize, participation in any promotion-related activity, or participation in the promotion, whether under a theory of contract, torts (including, without limitation, negligence), warranty, or any other theory or cause of action. No Injunctive Relief: EACH ENTRANT UNDERSTANDS AND AGREES THAT HE/SHE SHALL HAVE NO RIGHT TO ENJOIN OR RESTRAIN THE DEVELOPMENT, PRODUCTION, ADVERTISING, PROMOTION, DISTRIBUTION OR EXPLOITATION OF THE SWEEPSTAKESOR THE PICTURE, OR ANY OTHER MOVIE, PRODUCTION OR PROJECT OF PROMOTION ENTITIES OR ANY OF THEIR RESPECTIVE AFFILIATES. Sponsor. This Sweepstakes is sponsored by American Multi-Cinema, Inc., 11500 Ash St., Leawood, KS 66211. Sponsor will provide list of winners upon request. To obtain a list of the Sweepstakes winners or a copy of these Official Rules, send a self-addressed, stamped envelope to SKYSCRAPER c/o AMC 11500 Ash St. Leawood, KS 66211. *Other name and brand may be claimed as the property of others.